Fortress Of Freedom Board :: View topic - Pit Bull Owners Demand Repeal Of Bill 132! Pit Bull Owners Demand Repeal Of Bill 132! 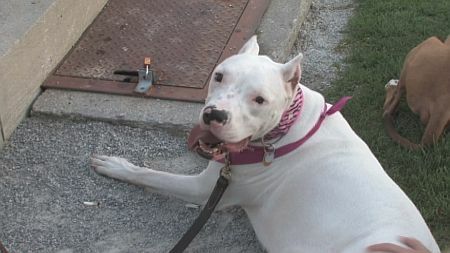 Posted: Sun Aug 29, 2010 11:08 pm Post subject: Pit Bull Owners Demand Repeal Of Bill 132! David brought his dog "Siris" to the event! Toronto, Canada - August 29, 2010. Pit Bull owners descended on Queen's Park (home of Ontario's Parliamentary Building) for a candlelight vigil to raise awareness of the "flawed" Ontario Bill 132 that bans 'Pit Bulls" and ask that if be repealed. Individuals who already own pit bulls will be able to keep them, provided they comply with requirements set out in the amendments and the regulations. Pit bulls kept legally after the ban will be known as "grandfathered" or restricted pit bulls. Born in Ontario within 90 days after August 29, 2005. " The amendments to DOLA provide that police officers, special constables, First Nations Constables, auxiliary police, municipal law enforcement officers, OSPCA inspectors and OSPCA agents are all designated as peace officers for the purposes of DOLA. Designated peace officers will be able to obtain warrants to seize a dog from a particular location where it is not desirable in the interests of public safety that the dog be so located. In exigent circumstances, designated peace officers will have a right of entry without warrant. Exigent circumstances include circumstances where there are reasonable grounds to believe that entry without warrant is necessary to prevent imminent bodily harm or death to any person or domestic animal. There are also provisions for seizure in public places." Being a dog owner as a kid I have a bit of a soft spot to those dog owners affected by the bill who take care of their pets. It was confirmed in the interview I had that day that it is the owner and not the dog at fault when dogs act aggressively and cause injury. Page from Ottawa brought her dog "Bella" to Queen's Park! I had only enough time to interview two of the owners as security wanted me and my car off the property, but they did give me some time to compile a story when I presented my press credentials. Not quite the royal treatment afforded to traditional broadcast media, but they did give me a break.